Welcome to the Law Offices of Ricky D. Gordon, P.A., where our philosophy is simple: we treat you the way we expect to be treated. This means that we give you—our client—the personalized care and attention that you need while we pursue your injury compensation with passion and dedication. We are a Florida personal injury law firm with a highly-regarded reputation for being "reasonable fighters". We are easy to get along with AND we do what it takes to protect your legal rights and fight for the personal injury compensation that you deserve for the injuries you suffered. 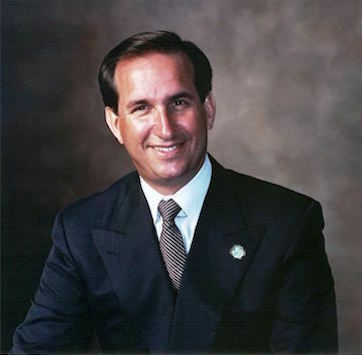 Coral Springs injury lawyer Ricky Gordon is a skilled negotiator and a well-respected trial attorney who has worked in the legal profession since 1979. 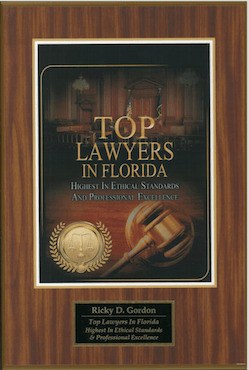 Ft. Lauderdale, Florida Attorney Gordon is licensed by the Florida Supreme Court to practice law in all Florida courts. He has earned the prestigious honor of being awarded an "AV" rating with Martindale Hubbell. 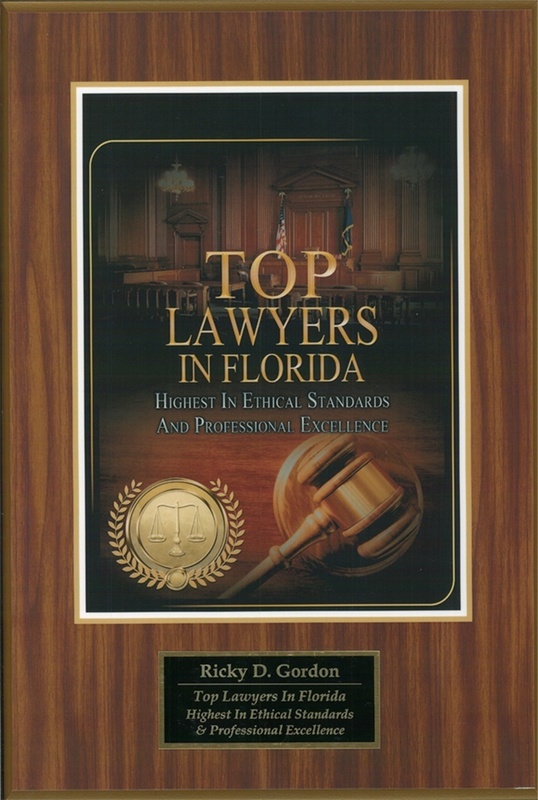 This is the highest achievable rating and ranks Attorney Gordon among the top 12% of attorneys in the United States for his preeminence, professionalism and ethics. 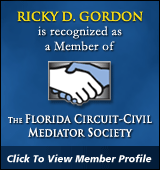 Florida Attorney Ricky D. Gordon and his highly trained and qualified legal team represent a select number of injury clients in cities throughout Broward County, Palm Beach County, Miami-Dade County, including Ft. Lauderdale, Coconut Creek, Coral Springs, Margate, Pompano Beach, Deerfield Beach, Tamarac, Sunrise, Ft. Lauderdale, Boca Raton, and the rest of Florida—from the Florida Keys to the Panhandle. We also work with clients who live in other states that were injured in Florida. Attorney Gordon has the resources to represent you wherever your injury accident occurred. The Law Offices of Ricky D. Gordon, P.A., operates based on a "win-win" basis meaning that we share the same goal of achieving a successful outcome for your injury case. You will only pay for our legal services if we obtain a recovery for you. This means we have the same incentive as you do for succeeding with your injury accident case—whether we are negotiating a large settlement for your car accident claim, winning your wrongful death lawsuit in court or obtaining disability and medical benefits in your workers' compensation case. Our track record of successful case outcomes speaks for itself. Coral Springs injury attorney Ricky Gordon will advance all costs for your personal injury case. Any fees that you do pay us will come from the financial recovery we obtain for you and not out of your own pocket. We will only accept your case if we feel that we can help you. Once we sign on as your Florida personal injury law firm, you can rest assured that you, your family, and the outcome of your injury case are in good hands. You will make the decisions in your case. However, our Coral Springs injury lawyer will guide you with our best advice and opinions based on our years of experience in handling thousands of cases so that you can make an informed decision. The Law Offices of Ricky D. Gordon, P.A. take pride in the fact that we are always available by telephone, e-mail, regular mail, and for in-person consultations to discuss your personal injury case and/or workers' compensation claim. Our objective is to be there for our clients when they need us. Please contact the Law Offices of Ricky D. Gordon, P.A. at any time for answers to your questions. Call us at (954) 753-0200 or, if you are calling from outside Broward County, Florida, call—toll-free—(800) 329-0201 to schedule your free consultation with Ft. Lauderdale, Florida personal injury Attorney Ricky Gordon.